Top professional female golfers can earn millions. A career as a professional golfer can provides a way for women to make money playing a game they love. Although getting into the profession can be tough, those who rise to the elite level can earn millions in prize money and endorsements. Beyond the spotlight of the Ladies Professional Golfers Association, there are thousands of women pursuing their dreams of playing professional golf. Every young female golfer who dreams of one day playing professionally probably envisions life in the LPGA. Qualifying to play on the LPGA tour is difficult, and with international competition growing, even college standouts struggle to qualify. There are, however, other tournaments that provide an avenue for budding professional golfers. Many young female golfers spend the earlier part of their careers playing on smaller tours such as the Symetra developmental tour, the Cactus Tour in Arizona or the Sun Coast Series in Florida. Similar to minor league baseball, these tournaments provide an avenue for players to work their way toward the big league. Professional golfers lucky enough to qualify for the LPGA travel constantly. Just from February to April in 2013, the tour schedule included tournaments in Singapore, Thailand, Australia, California, Hawaii, Arizona and Texas. Travel to these exotic locals usually means hitting the golf course for practice rounds, meeting with potential sponsors and taking questions from media at press conferences. In her book "Swinging from My Heels: Confessions of an LPGA Star," golfer Christina Kim described the tour as "a traveling circus that barnstorms in and out of a new town every week." Tournaments are where professional golfers earn their money. Although tournaments are played Thursday through Sunday, players start to arrive the previous Sunday. Official practice rounds start on Monday. This allows players to get accustomed to the course and weather conditions. Once play begins on Thursday, golfers are under pressure to "make the cut." After two rounds of golf, players are ranked based on their two-day total. Those who make the cut compete for a pool of prize money distributed based upon finish. 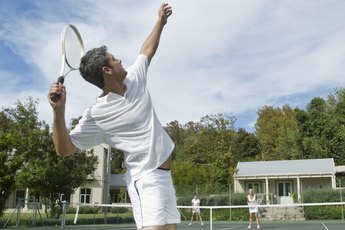 Unlike female tennis players, who earn as much as male tennis players, professional female golfers earn a fraction of what their male counterparts get. The 69th-ranked golfer on the Professional Golfers Tour earns as much as the second-ranked player on the LPGA tour. Likewise, the female winner of the Wimbledon tennis championship earns more money from that one event than most professional female golfers earn per year. Travel, coaching, physical therapists and equipment costs can eat away at earnings, and many female golfers supplement their income through sponsorships and endorsements. How Far Is Walking 18 Holes? 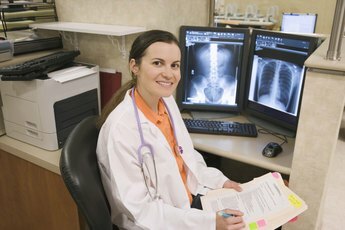 Do MD Radiology Fellows Get Paid?